I told Older Sister not long ago that I come up with great inventions all the time. I have some food-related inventions, too. One of them is called Saturday morning milk, and I mentioned it in a blog a few months ago. Another idea that I had was actually made. The good people at Gelateria Naia had some friends over at Takara Sake who were willing to give them a hand in making my gelato idea: sake flavored gelato, as an homage to San Francisco's Asian cultural (see under July). New York Coffee Cake Break is coffee ice cream with a chocolate fudge swirl, espresso bits, and hunks of frozen coffee cake, with particular emphasis on the crumble topping. There are two doses of caffeine, plus three meals (dessert, breakfast, and coffee break) rolled into one, to keep you going at the pace of a New York minute. 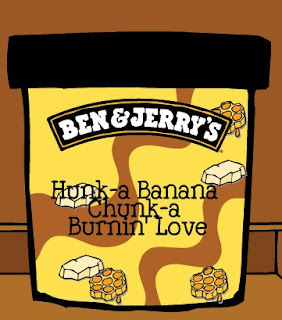 Note: I actually have submitted both of these ideas to Ben & Jerry's. Don't be cruel. Make my flavors!